How to Install a License Plate Frame the RIGHT Way? 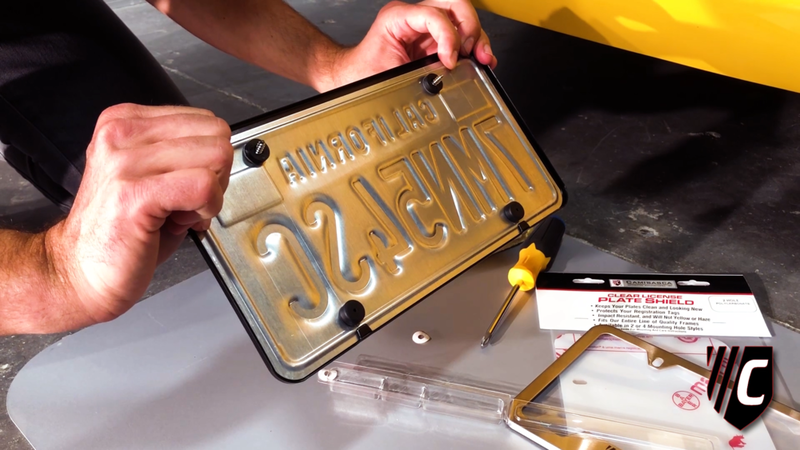 — Camisasca Automotive Manufacturing, Inc.
How to Install a License Plate Frame the RIGHT Way? Colin shows you how to install a license plate frame that will protect your vehicle's paint, prevent vibration and complement your vehicle's trim like the pros. Need a shopping list? We explain how to choose the best license plate frame for your vehicle. Create a clean slate by removing your license plate and wiping it clean of any dirt or debris. This is also a great opportunity to wash and wax the area behind your plate. Peel the paper from the rubber spacers, revealing the adhesive. Align spacers with mounting holes and stick to back of license plate to prevent vibration and protect the vehicle. If your vehicle only allows for 2-hole mounting, insert rubber plate bumpers into the lower holes. Insert the bottom edge of the license plate into the frame so the mounting tabs hold the plate in place. Insert stainless steel screws through the hardware hider caps. Align license plate and frame with mounting holes on vehicle. Slowly thread each screw with hardware hider cap into the vehicle mounting hole in a clockwise direction. Tighten screws until they are seated firmed against the frame. Firmly snap all hardware hider caps closed. Remove any finger prints from license plate frame using a microfiber towel. Take a photo and tag #camincusa or send to marketing@caminusa.com. Since 1982, we have led the industry as a top supplier of automotive accessories to U.S. auto manufacturers. Today we proudly serve over 40 automotive OEMs and many corporations and small businesses, providing custom accessories from our Southern California production and distribution facilities.